There are a number of beautiful Turks and Caicos villa rentals with late availability for Christmas (arrive Saturday, December 19 and depart Saturday, December 26, 2015) and/or New Year (arrive Saturday, December 26, 2015 and depart Saturday, January 2, 2016). There may never be a better chance to spend the Christmas and/or New Year Holidays in the Turks and Caicos Islands. Here’s an overview of all the Turks and Caicos villa rentals with late availability for the Christmas and/or New Year Holidays. Christmas ONLY $10,350 for the week! New Year ONLY $15,700 for the week! Plum Wild, Grace Bay Beach, Providenciales (Provo), Turks and Caicos Islands - a brand-new, spacious, modern, beach villa rental with 2 master bedrooms, 2.5 bathrooms, freshwater swimming pool and a roof terrace offering spectacular views of the turquoise sea. This Turks and Caicos vacation villa rental is the perfect choice for two couples or a family of four and is ideally located in the highly sought-after Turtle Cove area of Grace Bay Beach. It's only a short walk to numerous restaurants and Turtle Cove Marina. Find out more about and see the full photo gallery of Plum Wild, Grace Bay Beach, Providenciales (Provo), Turks and Caicos Islands. Christmas ONLY $29,500 for the week! Escape to the space and luxury of The Windermere, a stunning, 5 bedroom, Caribbean luxury villa rental in the exclusive residential community of Leeward, Providenciales (Providenciales), Turks and Caicos Islands, BWI. This chic holiday villa features contemporary decor, an imaginative swimming pool which extends under the living room floor, and even a private boat dock on the turquoise Leeward Canal. The Windermere is only a short drive or a 10 minute walk to magnificent Grace Bay Beach or Blue Haven Marina. 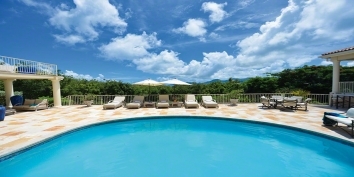 This Turks and Caicos luxury villa rental will create memories that last a lifetime! Find out more about and see the full photo gallery of The Windermere, Leeward Canal, Providenciales (Provo), Turks and Caicos Islands. Christmas ONLY $9,650 for the week! Miami Vice Two was just completed in December 2014. This Caribbean villa rental provides contemporary luxury and is located oceanfront with views of Sapodilla Bay, Providenciales (Provo), Turks and Caicos Islands, B.W.I.. Miami Vice Two features two equally beautiful master bedroom suites, with private en-suite bathrooms and a large, diminishing-edge swimming pool with spacious terrace. Find out more about and see the full photo gallery of Miami Vice Two, near Sapodilla Bay Beach, Providenciales (Provo), Turks and Caicos Islands. Christmas ONLY $7,500 for the week! Villa Positano, Sapodilla Bay Beach, Providenciales (Provo), Turks and Caicos Islands, is an intimate, one bedroom, beachfront vacation rental with private swimming pool. This is the perfect location "just for the two of you" and you will want to return again and again and again. Find out more about and see the full photo gallery of Villa Positano, Sapodilla Bay Beach, Providenciales (Provo), Turks and Caicos Islands. Christmas ONLY $6,050 for the week! Water Edge Villa, Grace Bay Beach, Providenciales (Provo), Turks and Caicos Islands, provides everything you would expect from a luxury beach villa, but was specifically built to luxuriously accommodate two guests. This luxury Turks and Caicos beach villa rental has one, gorgeous master bedroom suite, with en-suite bathroom, swimming pool and fantastic views of both Grace Bay and Turtle Cove Marina. Find out more about and see the full photo gallery of Water Edge Villa, Grace Bay Beach, Providenciales (Provo), Turks and Caicos Islands. Sea Edge Villa is perfectly located on world-famous Grace Bay Beach, Providenciales (Provo), Turks and Caicos Islands, and provides contemporary luxury for just two guests. This Turks and Caicos luxury vacation villa rental has one beautiful master bedroom, with en-suite bathroom, freshwater swimming pool and spectacular views of Grace Bay and the Turtle Cove Marina. Find out more about and see the full photo gallery of Sea Edge Villa, Grace Bay Beach, Providenciales (Provo), Turks and Caicos Islands. Ocean Edge Villa provides contemporary and romantic luxury right on magnificent, Grace Bay Beach, Providenciales (Provo), Turks and Caicos Islands, B.W.I.. This Turks and Caicos luxury vacation villa was specifically built to luxuriously accommodate two guests in one gorgeous master bedroom suite, with en-suite bathroom, swimming pool and fantastic views of the ocean and Turtle Cove Marina. Find out more about and see the full photo gallery of Ocean Edge Villa, Grace Bay Beach, Providenciales (Provo), Turks and Caicos Islands. Christmas ONLY $53,200 for the week! ‘Mothershouse’ in Providenciales (Provo), Turks and Caicos Islands was designed by award winning architect Ron Shaw and built on the peaceful Babalua Beach situated close to Turtle Cove Marina. The villa is visually stunning yet still provides a child friendly and secluded vacation retreat for your family and friends. Mothershouse is not only a great location but is also suitably equipped for destination weddings, energy yoga weeks and corporate events. Find out more about and see the full photo gallery of Mothershouse, Babalua Beach, Providenciales (Provo), Turks and Caicos Islands. Christmas ONLY $9,000 for the week! Twelve Palms Villa, Providenciales (Provo), Turks and Caicos Islands, is a spacious and breezy 3 bedroom, 3.5 bathroom Mediterranean-style oceanfront vacation home. This Turks and Caicos villa rental is the perfect island retreat to hide out for a week or even a month. 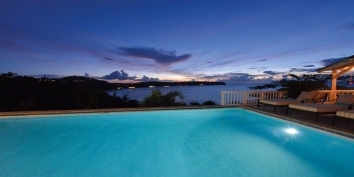 Twelve Palms Villa is located on prestigious Ocean Point Drive between Taylor Bay Beach and Sapodilla Bay Beach and has a large infinity swimming pool, a hot tub, a pagoda for alfreso dining and a waterfront swim dock. Find out more about and see the full photo gallery of Twelve Palms Villa, Ocean Point, Providenciales (Provo), Turks and Caicos Islands. Villa Mariposa is a private, oceanfront villa nestled in a half acre of tropical gardens on Ocean Point, Providenciales (Provo), Turks and Caicos Islands. This charming, fully equipped, Turks and Caicos villa has three bedrooms, three bathrooms, a private pool, large boat dock and stunning ocean views. Find out more about and see the full photo gallery of Villa Mariposa, Ocean Point, Providenciales (Provo), Turks and Caicos Islands. Christmas ONLY $4,900 for the week! Ballyhoo Cottage, Providenciales (Provo), Turks and Caicos Islands. A charming, intimate, beachfront, holiday cottage with private swimming pool, gazebo, and fantastic views. This Caribbean rental cottage has one bedroom, one bathroom, open plan living room and kitchen, and even a hammock hut on beautiful Grace Bay Beach! Find out more about and see the full photo gallery of Ballyhoo Cottage, Grace Bay Beach, Providenciales (Provo), Turks and Caicos Islands. Christmas ONLY $5,050 for the week! Nutmeg Cottage, Grace Bay Beach, Providenciales (Provo), Turks and Caicos Islands, offers intimate luxury in a one bedroom, one bathroom cottage on stunning Grace Bay Beach! This Turks and Caicos vacation rental is absolutely perfect for two guests and has a very private swimming pool and raised gazebo for stunning views of the turquoise sea. Find out more about and see the full photo gallery of Nutmeg Cottage, Grace Bay Beach, Providenciales (Provo), Turks and Caicos Islands. Christmas ONLY $4,400 for the week! Coriander Cottage, Grace Bay Beach, Providenciales (Provo), Turks and Caicos Islands — A romantic stone cottage in the Caribbean has one bedroom with a king-sized bed, marble bathroom, gourmet kitchen, living room with cathedral beamed ceiling, swimming pool, coral stone terrace, and is furnished to a very high standard with a large flat panel TV in the living room, a TV in the bedroom, and of course central air conditioning throughout. Find out more about and see the full photo gallery of Coriander Cottage, Grace Bay Beach, Providenciales (Provo), Turks and Caicos Islands. NOTE: All of the above rates are subject to an additional 12% government tax. All rates and availability information were correct at the time of publishing, but are subject to change at any time without notice.